When is the Fibre National Broadband Network (NBN) coming to your suburb? Is your business or home in a current Fibre NBN service rollout area? 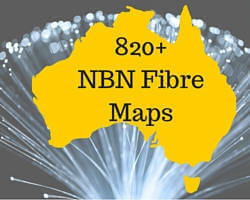 See over 820 detailed maps of Fibre NBN service areas around Australia. This includes current and future rollout information. Green = NBN Fibre Planning (~12 months or less to ready). Brown = NBN currently cabling (~ 8 months or less to ready). Check NBN suburb map link for status changes. Use the + - options to zoom out after you click a map link. Zoom - at least 3 times initially to see the region. The map link is a Town, State search. See NBN Business Plan - What can be done now? 74 ways to use the NBN. Make your own custom list. Audit your site in preparation for the NBN. Save time and avoid issues. 2 NBN Satellites for remote Australia.First satellite launch was on 1 Oct 2015. Most towns with 1000 premesis (homes + businesses) will have a fibre connection. NBN connection may be gained by fixed wireless link or satelite at lower speeds. This is due for completion by 2016. Prices are similar to ADSL with much more speed and download limits.